Spotify, the most used music streaming platform in the world is a staple for any music lover. However for users that listen to music with large groups of friends, or at a party, Spotify is distinctly singular. 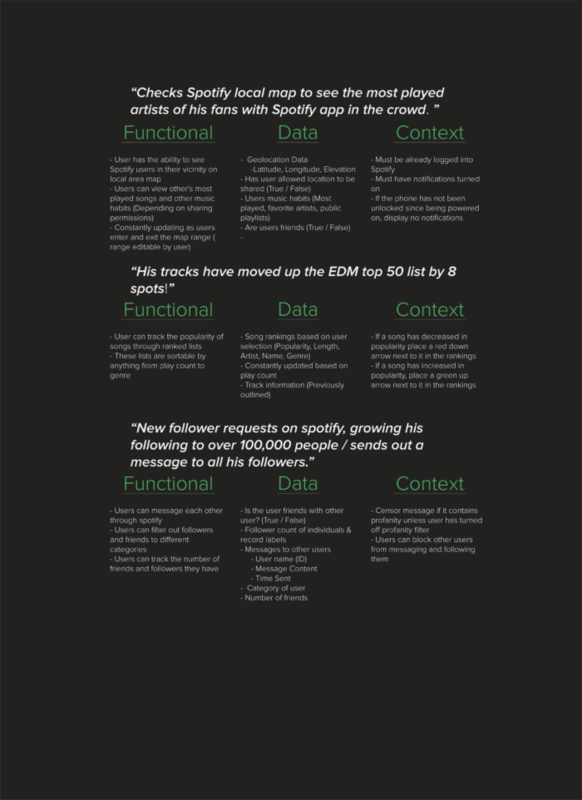 My goal over this month long project was to conduct an in-depth research study of Spotify and learn from their users, what changes they would like to see. ‍How heavily do you use Spotify? ‍On what device do you most commonly use Spotify? 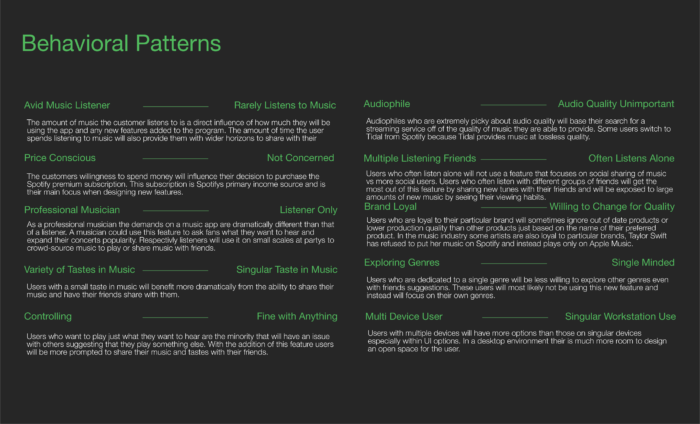 ‍How satisfied are you with the variety of music available on Spotify? ‍What is one feature you wish Spotify would add & remove from their service? What, if any, issues have you encountered while using Spotify? With the information gained from my research, I identified the 10 most prominent behavioural variables and determined the two sides of the variable. 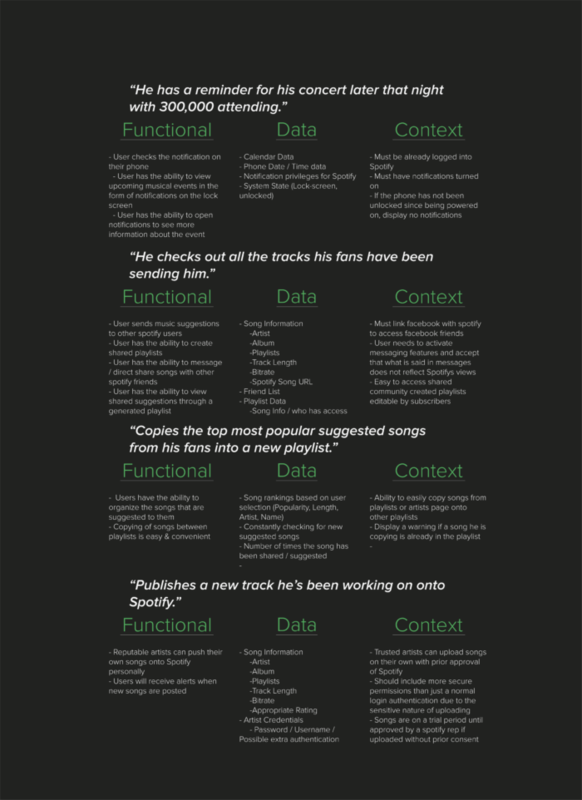 (Ex - Listens to a lot of music vs Rarely listens to music) These 10 patterns showed me what was important to my users and what was not, and gave me a starting point for the development of personas. I narrowed these 10 patterns down further into 5 key behaviours and mapped them by importance to my three personas. 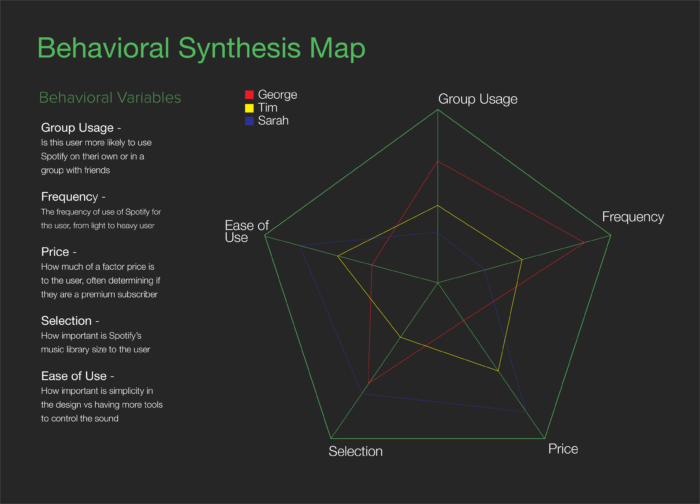 The behaviour synthesis map is a great way to visualise what each persona values, allowing you to tailor the design to meet everyone's goals. I developed three personas for this project, one Primary persona, one secondary and an Anti-Persona. I developed these personas focusing on the 5 main behavioural variables I previously identified and in conjunction with the personas general expectations and desires. My primary persona was a 26-year-old male DJ who would use Spotify in a variety of different circumstances from concerts to on his phone while jogging. He was very comfortable with technology and was able to use a slightly more complex UI in favour of having more control over the music sound and quality. 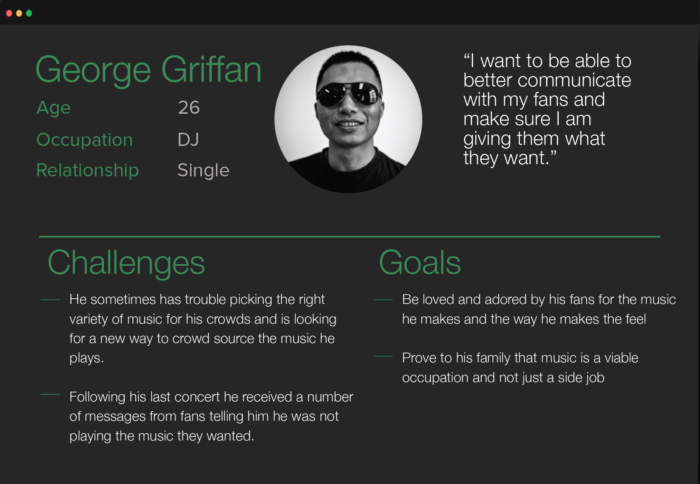 The main additions that he benefited from the most were a local area map and the shared playlists because they allowed him to increase fan interaction. Developing a context scenario allowed me to focus on the big picture scenario from a fairly high level without getting specific about any interfaces or technologies. It is important to keep the door open for interesting solutions at this point in the design process because it is always possible to scale it back later. The form is not discussed at all, only the behaviour of the user and the system. What setting's will the product be used in? Is the user using the product alone or in a group? With what other products could it be used with? What primary activities does the persona need to perform to meet their goals? How much complexity is permissible? Breaking down the context scenario into the design requirements was the next step. 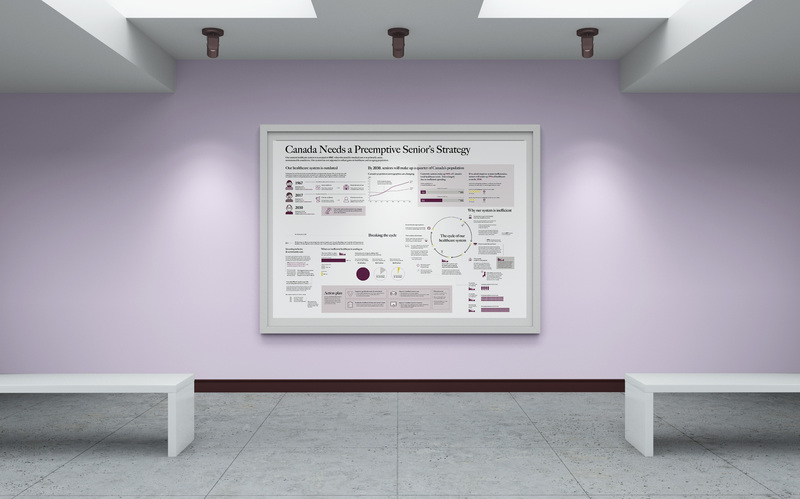 Each step of the scenario was broken down into Functional, Data and Contextual information. This helps extract the data points from each step of the context scenario and show me exactly what elements are needed in the design and what can be ignored. 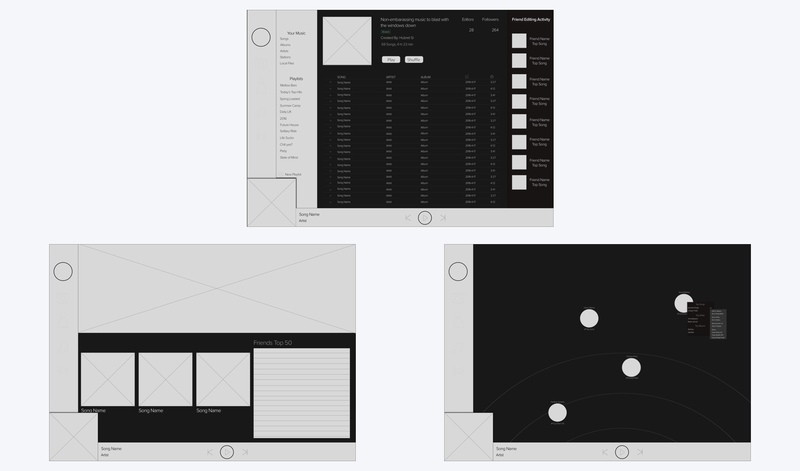 I sketched out a number of screen prototypes for both mobile and desktop layouts that would be the building blocks for my high fidelity mockups. 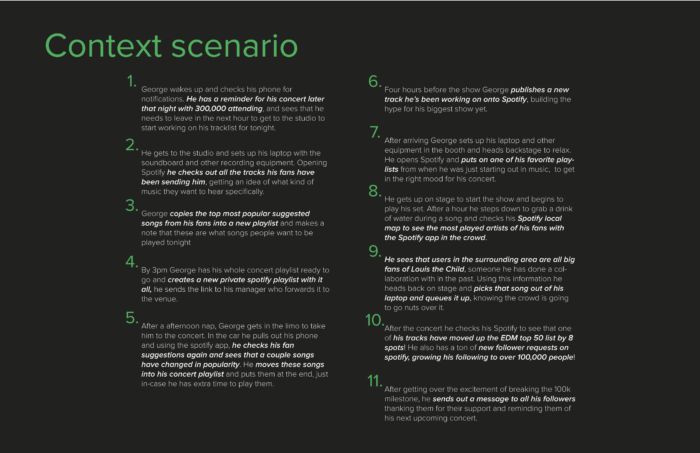 Because Spotify is used by so many millions of people a large scale change to the interface could confuse long term users so I opted to keep the majority of the interface as is and make as small changes as possible. 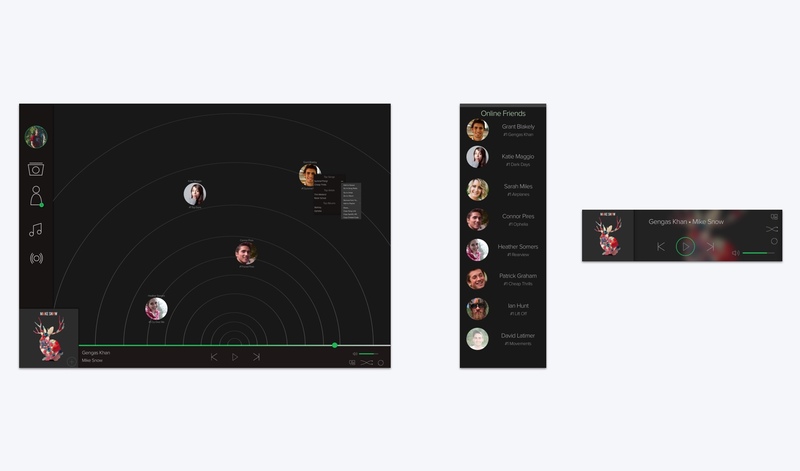 Transitioning from sketches to gray box prototypes is an important step that is often overlooked. Graybox prototypes give you the opportunity to figure out spacing and element placement without going in depth in the content. 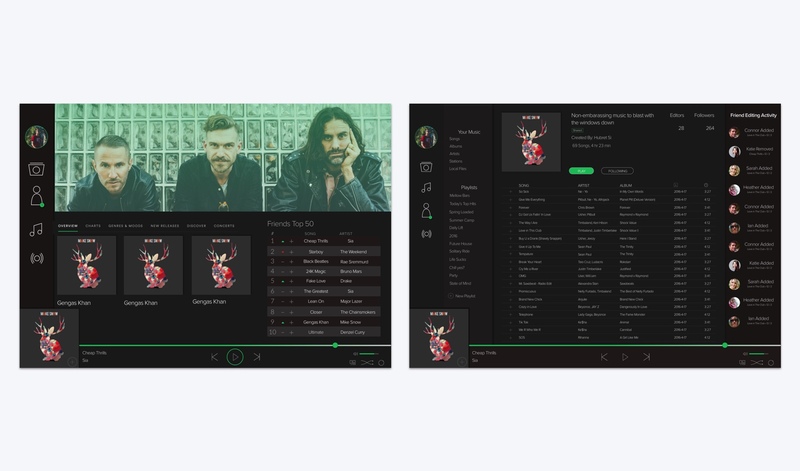 Transitioning from sketches to high fidelity mockups is my favourite part of the design process, especially in this project because I am a very heavy user of Spotify. 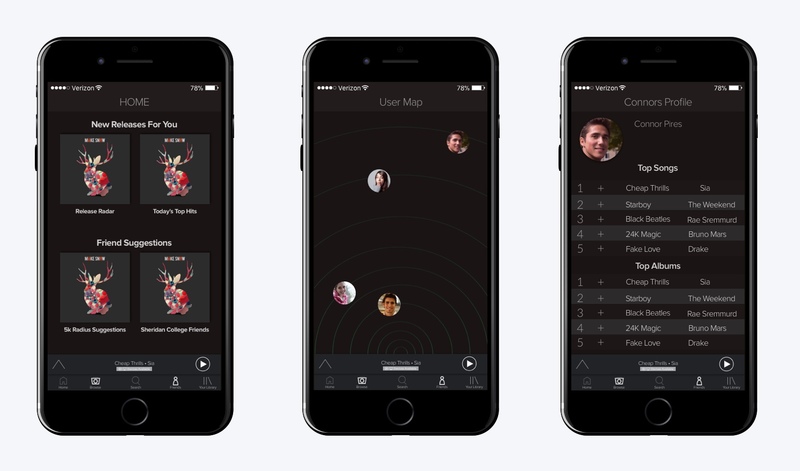 These final mockups covered a revised playlist page, a local area user map and the updated home browsing page. Working on this project was the first time I had worked on a project that covered desktop and mobile and it brought a new set of problems to light for me. 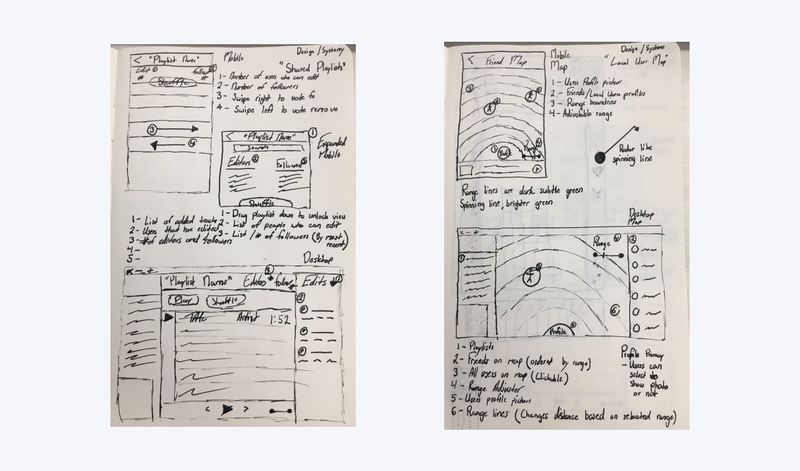 Developing a product that works for all ages of users, in a variety of conditions on both desktop and mobile showed me how much the ideas you have can change dramatically over the course of the design process. 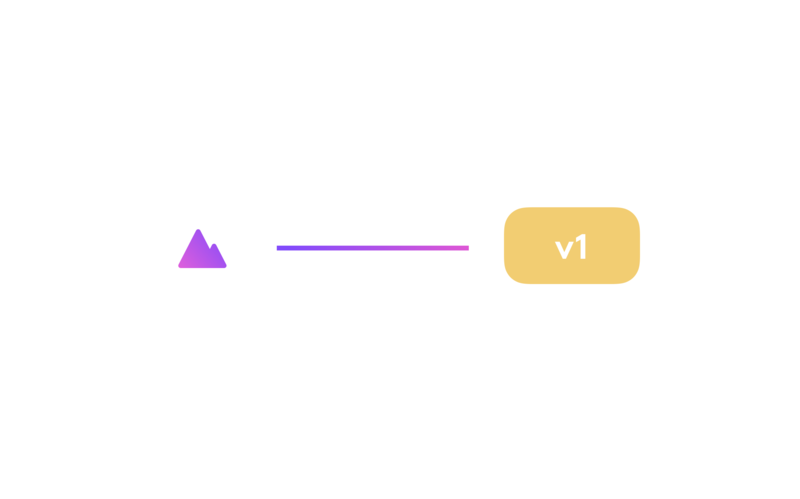 Working with users to conduct extensive research gave me a very good idea of what the actual design process looks like when working on real projects and I can't wait to work on more in-depth and realistic projects.